This template was made in After Effects and it is compatible with all versions from Cs5 to above. Christmas is the perfect Christmas Greetings AE template: very easy to customize and fast to render. You can use it on your website, use it on your newsletters or send it to your friends relatives and clients. Through an useful control panel you can change the color for each ribbon so, for example, you can use the colors of your corporate identity. Christmas template was made in 3D so all animations are pre rendered. It means that your render time will be more fast. The codec used for these animation is Quicktime PNG in order to guarantee the best quality! Customize this template is very easy and intuitive, in fact you have just to type your best wishese in the corresponding text layer and change the existing logo with yours or with your signature. 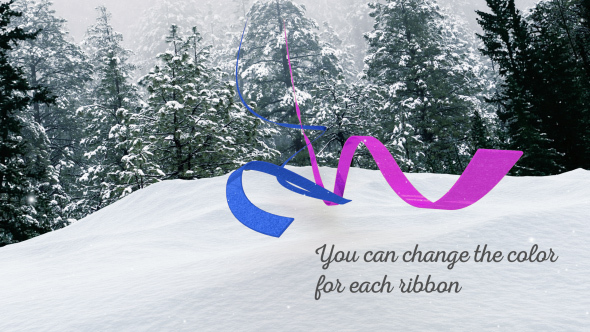 After that you can change some colors in this animation, like the color of the ribbons or of the falling balls at the end of the animation. Now you are ready to render it! You could opt to export your animation in mp4 with a bitrate of 4 or 5 MB so the final file size will be very small and you’ll be able to send it directly via email! 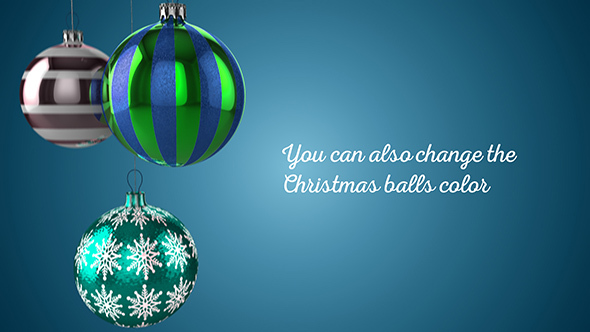 You can also change the colors of the final Christmas balls or hide them, furthermore they are pre rendered with alpha channel: it means that you could also use them outside this template, for example on a different background like a solid or a gradient tint (see the image below) or over videos and images.